From spare bedrooms to studios, a newly converted attic is a more cost effective way to add space than moving home. Image by PlusONE (via Shutterstock). The attic is a good place for an extra room. Once you have had an attic conversion, you may be wondering how to use the extra space. We at Steven Cleary Carpentry have a few suggestions you might like. The most common use of an attic conversion is as a spare bedroom. You may consider moving up from a two bedroom house to a three bedroom house an expensive option. Using your loft could be make for a good room for guests. Instead of cluttering up your living room or bedroom, why not turn your loft into a library? You could use your newly converted loft as a place for your treasured book collection or record collection. 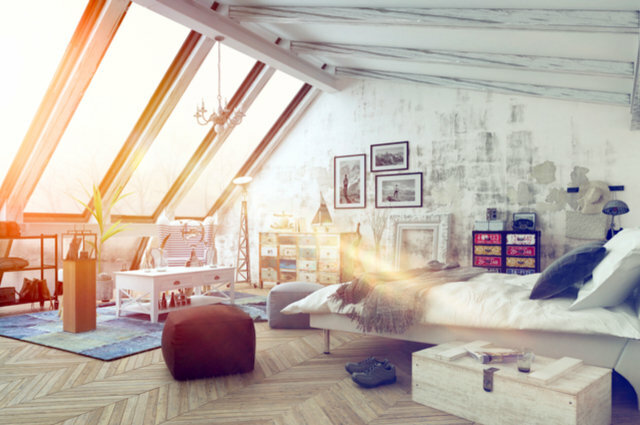 If your attic conversion has a suitable level of natural light, an art studio could be a good use. This works well if you chose to have a number of roof lights or a dormer window. Some of the lower parts of the attic walls could be used for shelving, making best use of otherwise dead space. Steven Cleary Carpentry, 26 May 2017.